I was originally introduced to this by co-worker who wanted me to look at someone’s netbook and wrote about it here. The malware-scareware program had already been removed from the system, but the damaged it done had been left behind. Cleaning it up manually, though, would not be too difficult. As pointed out, its counters the user attempt to stop it by taking advantage of a built in process that Windows uses for debugging applications by pointing the Task Manager and Regedit to its own fake anti-virus process. Further, it also counters anti-malware utilities and virus security suites by creating reg keys and using the same Debugger string to point to svchost.exe, which is not able to run other executables. The key to getting access to the registry and the task manager directly was to use AutoRuns. To see if I could work around this, I renamed procexp.exe on the desktop to proc.exe and successfully fired it up. I suppose this could be used to launch or download additional programs or run commands by going to a URL that hosts a script. Or it could be a reporting database. Currently the URL only opens a page that says “OK”. Besides the executable itself, the registry is modified to include hundreds of anit-malware\anti-virus program keys (approx 764 here). In my case, I run Microsoft Security essentials, which became disabled by creating a key named msseces.exe in Image File Execution Options and pointing it to svchost.exe. Also, if you are running a 64 bit OS, the keys created in HKLM\Software\Microsoft\Windows NT\CurrentVersion\Image File Execution Options will also be created in the WOW6432Node key. result.db file in the same path as the malware executable. These are the fake infection results. C:\Users\username\AppData\Roaming\Macromedia\Flash Player\macromedia.com\support\flashplayer\sys\#local\setting.sol. This is a “flash cookie”. C:\Users\William\AppData\Local\Microsoft\Windows\Temporary Internet Files\Content.IE5\<RandomeFolder>\cmyip_com.htm. This contains the public IP of the affected system. Start Process Explorer or some other non-Windows process utility. You might need to rename it as in my case. Kill the protector-.exe process or any other suspicious process. The description is enough to give it away. Delete the malware program from the system. Then focus on the reg path, select all, and Delete. You will need to run RegScanner as Administrator. 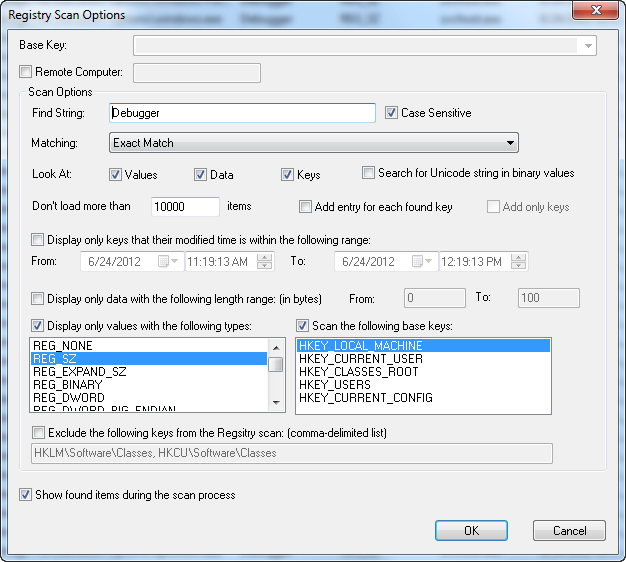 Another option to run a script that cleans up all reg keys in Image File Execution Options with REG_SZ string Debugger. Turn UAC back on if it was set to off. This entry was posted on June 28, 2012 at 4:56 pm	and is filed under Troubleshooting, Troubleshooting Tools. Tagged: Malware. You can follow any responses to this entry through the RSS 2.0 feed. You can leave a response, or trackback from your own site.